Children, 4-6 years old, learn effective street-proofing and life skills in an supportive and fun environment. Emphasis is placed on developing balance, coordination, respect, self-esteem and self-discipline. Good values and character development are an integral part of our Little-Ninjas program for ages 7 to 9. Words such as honesty, patience, humbleness, humor and respect are all familiar to the martial artist. Students who achieve these qualities have been known to improve grades and develop positive learning habits that can be applied at home and school. We teach traits that are useful not only now during their formative years but throughout their lives as well. Students between the ages 10 and above learn the fundamentals of Jiu Jitsu as well as develop character, leadership skills, self confidence, and physical fitness. Jiu Jitsu is a well rounded martial art system that prepares you for today’s society. 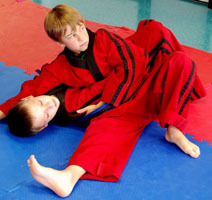 Our comprehensive curriculum at the preteen level covers four ranges of self defense. These ranges are punching, kicking, standup grappling and ground grappling.